This is a shy bird more often heard than seen, most often seen after being heard. It has a large, flattened head and a short, deeply notched tail. The face, the nape of the neck, and the central crown stripe are all olive green. A dark line from the base of the bill to the breast is a “whisker” stripe. The breast, sides, and flanks are finely streaked. A two note, weak, “see-lick”, sounding much like a cricket. Baird’s Sparrow (Ammodramus bairdii) has a buff-colored head and a long tail. Crickets, short-horned grasshoppers, beetles, spiders, butterfly larvae, bees, and seeds. The taxonomic arrangement below follows Sibley/Monroe World List of Bird Names. It is based on DNA relationships and is being adopted by a growing number of ornithologists worldwide, including National Center for Biotechnology Information (NCBI)34. The rearrangement has been adopted in part by the American Ornithologists’ Union (AOU). However, the AOU has not adopted the rearrangement of New World sparrows. In the Sibley/Monroe arrangement, the family Emberizidae (buntings, American sparrows, and relatives) is merged with the family Fringillidae (finches and Hawaiian honeycreepers) and Emberizinae and Fringillinae are subfamilies. 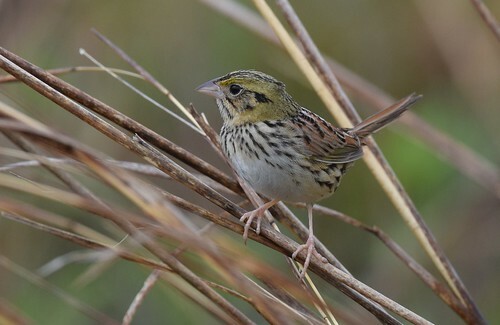 Molecular studies suggest that Henslow’s sparrow is closely related to Baird’s Sparrow (Ammodramus bairdii), and that the two species should be placed into their own genus. Avibase lists this species as Centronyx Ammodramus. The Henslow's Sparrow is an inconspicuous little brown bird that inhabits grassy meadows in the Midwest and portions of the East. It's song is an extremely high-pitched, metallic "tsi-di-lick" that reminds one of the chirp of a cricket. Described by Roger Tory Peterson as "one of the poorest vocal efforts of any bird," the song transforms into a delightful musical cascade when slowed down to about one-quarter speed. This sparrow is becoming rare and local in weedy fields. 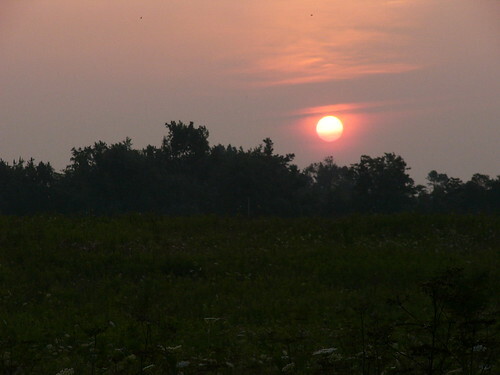 Eastern and central United States; southern Ontario. It is a short-tailed and flat-headed sparrow with a big pale bill. Breast is finely streaked. It has a striped crown and olive head. The wings are reddish. It is secretive and may be overlooked but for its distinctive voice. The song is a hiccuping unmusical "sslick". Henslow's Sparrow (Ammodramus henslowii ) singing in Goose Lake Prairie State Park Illinois . This is very secretive and unremarkable sparrow. Mostly seen when sings. A Henslow's sparrow sings its simple song on the prairie at Shaw Nature Reserve in Missouri.